There are few times one will see more than one electric airplane at the same place – outside of perhaps, Friedrichshafen’s e-Flight Expo every year. But to see them flying at the same field on the same day is an even grander delight. That happened September 9 and 10 at Grenchen, Switzerland. 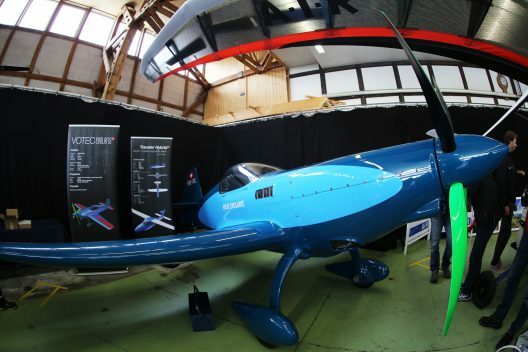 Grenchen hosted the world’s first all-electric fly-in – the SmartFlyer Challenge. It drew an appreciable number of electric aircraft of all sizes and types despite the clouds and rain that kept some from scaling the mountains. 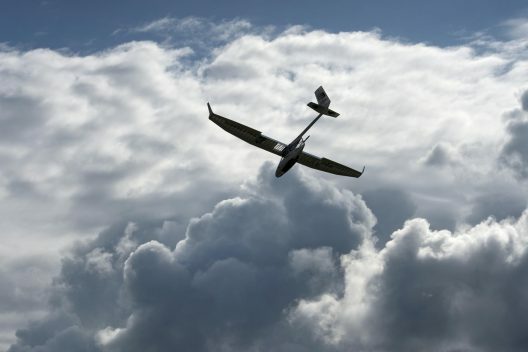 The Siemens-powered Magnus e-Fusion from the Czech Republic, the electric Phoenix motorglider, and Stuttgart University’s e-Genius all flew formation with a Piper L-4, a World War Two liaison aircraft and camera plane. They joined a commendable group of aircraft on the field. 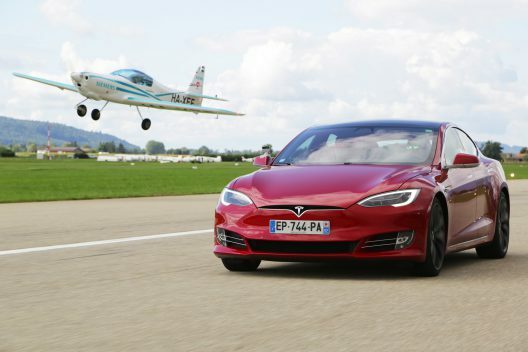 All seemed to fly as much as possible during the event, including drag racing a Tesla S sedan down the runway. Aircraft on the field included e-Genius, second-place winner of the 2011 Green Flight Challenge. 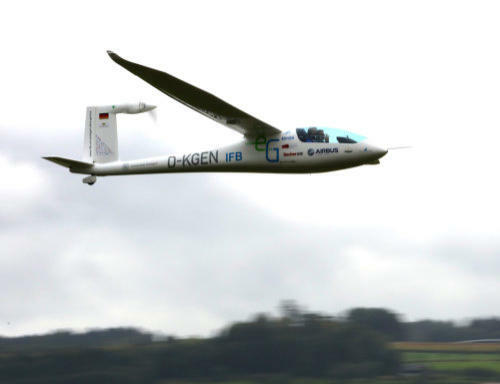 It made the first landing at Grenchen by an electric airplane. Another craft from Stuttgart, Icare 2, is a solar-powered sailplane flying since 1996 and holding many records, set first by its project leader, Rudolf Voit- Nitschmann, and followed with a series set by Klaus Ohlmann. Both aircraft have the tail-mounted propeller configuration favored by Voit-Nitschmann, creating only a fraction of the skin friction a front-mounted propeller does. This same configuration is used by the group designing the Smart Flyer, a four-seat hybrid with its base in Grenchen. Several trikes flew in, including an A-I-R Atos, which made the first electric takeoff from the field. Another craft based on the field, the Votec Evolaris, has a modified Brusa motor and was undergoing runups prior to the fly-in. Two presenters brought slides but no airplanes. Tomas Brodreskift flew by commercial jet from Norway and explained why “The [Equator] P2 is the next big thing in aviation,” with its amphibious capabilities and advanced hybrid power system. Tine Tomazic and Paolo Romagnolli discussed the creation of the Alpha Electro from design to serial production. A full speakers list included an introductory talk by Jean-Luc Charron, president of the French Aeronautical Federation. Frank Anton, head of Siemens electric aircraft motors program, discussed his company’s future in a growing and expanding market. Axel Lange detailed the Antares E2, his still advanced electric sailplane. Others filled in on regulations, technology, and new developments. 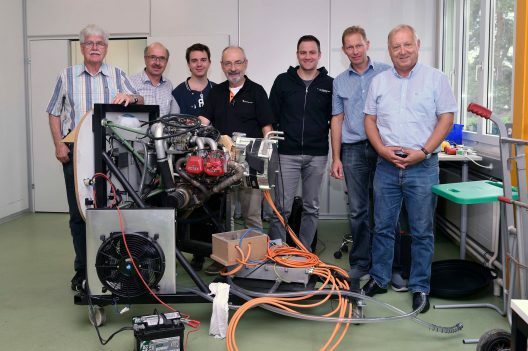 One Facebook picture shows a group with a Rotax engine and hybrid-looking hookup, but little information as to its intended purpose. We will be happy to receive intelligence about this system. This is possibly the power setup for the Hybrid Traveler. Another ultralight from the Czech Republic, the Ultralight Design Ego Trike, showed its clean lines on the tarmac, also topped by an A-I-R Atos wing. 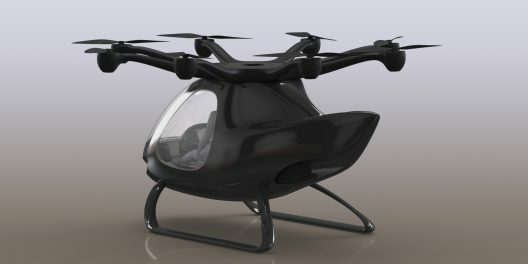 In a display hangar, the French Electric Aircraft Whisper eight-rotor helicopter looked intriguing, but there is little detail on their web site to answer questions arising from the craft’s appearance. 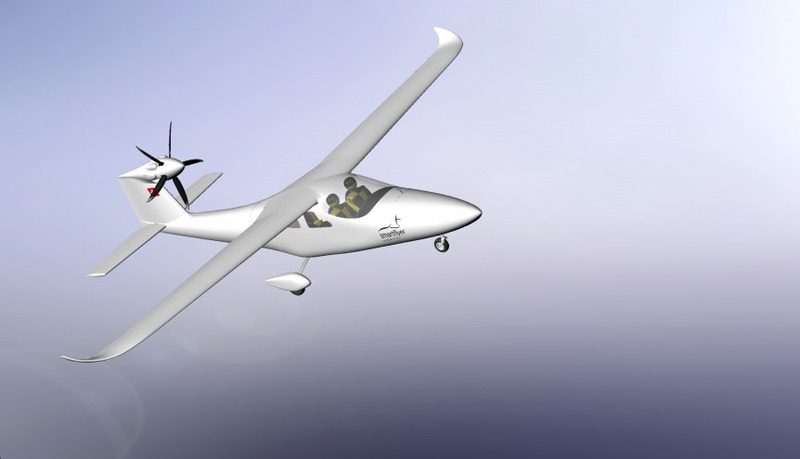 A Lange motorglider and Silent 2 showed that electric craft have been flying for several years, improving as better batteries become available. A lighter machine, the Ruppert Archaeopteryx, was piloted by Cornelia Ruppert, a company principle. She also made a presentation on her dream of flight, and how this airplane helps fulfill that. Short symposium sessions allowed time for participants to watch flight demonstrations and inspect craft indoors and out. We can hope that next year’s Challenge, planned for September 1 and 2 has better weather and pulls in an even larger crowd. Jean-Marie Urlacher is a master photographer who raises standards for air-to-air photographs. He kindly consented to allow some of his work to be used in this blog entry. Please visit his web site to be astounded at the clarity and daring of his work.